There are many monetary benefits and allowances that military members earn every two weeks on their paycheck. From Basic Allowance for Subsistence (BAS), Basic Allowance for Quarters, and Variable Housing Allowances, military members receive significant income that is not part of the taxable income and pay rates published for each rank. There are also a few more benefits such as naming a state as a home of residence like Texas or Florida that does not have state income tax, as well as the ability to legally get out of lease agreements and pay taxes when deployed overseas (some areas in the world). Remaining largely unchanged since 1940, The Soldiers' and Sailors' Civil Relief Act (SSCRA) was updated on 19 December 2003. The President signed HR 100 into law. This law significantly enhances the protections shown below. 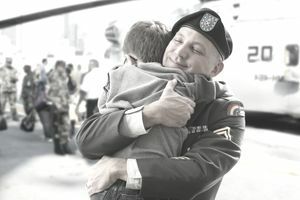 The SSCRA is a law that helps the military member to have more time to pay debts, honor contracts, pay taxes, maintain state of dwelling for tax purposes, be granted stays in legal proceedings, terminate lease agreements, and avoid eviction if military service is the cause of the member not being able to pay or honor such agreements due to service. The provisions of the SSCRA generally end when a service member is discharged from active duty or within 90 days of discharge, or when the service member dies. Portions of the SSCRA also apply to reservists and inductees who have received orders but not yet reported to active duty or induction into the military service. The very nature of military service often compromises the ability of service members to fulfill their financial obligations and to assert many of their legal rights. Congress and the state legislatures have long recognized the need for protective legislation. The Soldiers' and Sailors' Civil Relief Act of 1940 is essentially a reenactment of the 1918 statute. Experience during World War II and subsequent armed conflicts made certain changes in the statute necessary. The first of these amendments became law in 1942. In amending the Act, Congress was motivated, in part, by the desire to override court decisions that, in some instances, had led to restrictive interpretations of the Act. Reservists and members of the National Guard (when in active federal service) are also protected under the SSCRA. SSCRA (for all) begins on the first day of active duty, which means when the person ships out to basic training (Basic Training and job-school are considered active duty for Guard and Reserve personnel, as well as active duty personnel). Some protections under the act extend for a limited time beyond active duty discharge or release but are tied to the discharge/release date. A service member who is leasing/renting property used for dwelling, professional, business, agricultural or similar purposes may terminate a lease that was 1) signed before the service member entered active duty and 2) the lease/rented premises have been occupied for the above purposes by the service member or his/her dependents. The service member must deliver written notice of termination to the landlord after entry on active duty or receipt of orders for active duty. The termination date for a month-to-month lease/rental is 30 days after the first date on which the next rental payment is due after the termination notice is delivered. For example, if rent is due on the 1st of the month and notice is delivered to the landlord on August 5th, the next rent due is September 1st. Therefore, the lease/rental agreement will terminate on October 1st. For all other lease/rental agreements, the termination date will be the last day of the month after the month in which the notice was given. A service member may seek protection from eviction under SSCRA. The rented/leased property must be occupied by the service member or his/her dependents for the purpose of housing, and the rent cannot exceed $1,200. The service member or dependent who has received notice of eviction must submit a request to the court for protection under the SSCRA. If the court finds that the service member’s military duties have materially affected his ability to pay his rent timely, the judge may order a stay, postponement, of the eviction proceeding for up to 3 months or make any other “just” order. If a service member’s military obligation has affected his/her ability to pay on financial obligations such as credit cards, loans, mortgages, etc., the service member can have his/her interest rate capped at 6% for the duration of the service member’s military obligation. Qualifying debts are debts that were incurred before the service member coming on active duty. The service member must be on active duty at the time of the request, and the service member’s military career must have materially affected the service member’s ability to pay the debt. This provision does not apply to federally guaranteed student loans. A service member who is either the plaintiff or the defendant in a civil lawsuit may request a stay, postponement, of a court proceeding in which he/she is a party. A service member may request a stay at any point in the proceedings. However, courts are reluctant to grant stays at the pretrial phase of a lawsuit, such as discovery, depositions, etc. If a judgment is entered against a service member who is unavailable due to military orders, the service member may be able to have that judgment voided. In order to apply for these protections, the service member must actually be a party to the suit. The provision only applies to civil lawsuits, separation/divorce, suits for paternity, child custody suits, and bankruptcy debtor/creditor meetings. A service member or spouse may request protection under the SSCRA for pre-service debts incurred under installment contracts and auto leases. The service member or the spouse must prove that the service member’s military obligations have materially affected his/her ability to pay the debts. Also, at least one deposit or installment payment must have been made on the contract before entry on active duty. If the contract falls under the protection of the SSCRA, the creditor is thereafter prohibited from exercising any right or option under the contract, such as to rescind or terminate the contract or to repossess the property, unless authorized by a court order. A service member or dependent may, at any time during his/her military service, or within 6 months thereafter, apply to a court for relief of any obligation or liability incurred by the service member or dependent prior to active duty. Or, furthermore, in respect to any tax or assessment whether falling during or prior to the service member’s active military service. The court may grant stays of enforcement during which time no fine or penalty can accrue. Though not completely related, but often confused, the Uniformed Services Employment and Re-Employment Rights Act of 1994 (USERRA), allows for deployed reservists or National Guard members to not lose their job upon return.